70's, Chile. 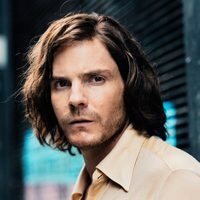 Florian Gallenberger directs this political thriller that tells the story of Lena (Emma Watson) and Daniel (Daniel Brühl), a young couple who is involved in the Chilean military coup in 1973. 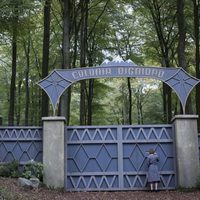 Daniel, the boyfriend of Lena, will be abducted by Pinochet's secret army, while Lena is forced to flee to a further area in the south known as "Colonia Dignidad', a sect where no one couldn't escape. 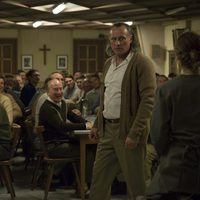 La Colonia is a charitable association headed by lay preacher Paul Schafer, character played by Michael Nyqvist; an "organization" Lena cannot escape from, but it will become her only way to find Daniel. The famous Hermione of 'Harry Potter' starring by the movie, whit Daniel Brühl as her coworker. Write your own 'The Colony' review. Colonia Dignidad was a chilean village founded by german exiles and inmigrants after WWII. During Augusto Pinochet's dictatorship this place turned into a prison and torture camp controlled by a cult. The village is currently named Villa Baviera. In 2014 Emma Watson visited Villa Baviera in what was at first thought to be a simple vacation trip by the press. Recently it has been revealed that she was paying a visit to the former Colonia Dignidad in order to research for her role. This is the second Emma Watson's film where she confronts a dangerous cult, after 'Regression' (2015).